Detox Dieter’s review of Leaky Gut Syndrome details important natural diet steps to take in order to prevent the discomfort associated with this common digestive disorder. Leaky Gut Syndrome is a debilitating and dangerous condition. This report provides you with the information to address the health conditions associated with Leaky Gut Syndrome. Leaky gut syndrome is the technical name for increased intestinal permeability. As its name signifies, this condition is characterized by a gut (intestinal tract) that allows far too many undigested substances into the bloodstream. The body often responds by “attacking” these substances, resulting in digestive discomfort, autoimmune conditions, and food allergies. In many cases, leaky gut syndrome will actually contribute to the body attacking itself, increasing the risk of autoimmune disease such as alopecia, celiac disease, Graves’ disease, endometriosis, and many more. A substantial proportion of the population suffers from immune diseases, which are often chronic, debilitating, and life-threatening. There are more than eighty illnesses caused by autoimmunity and about 75 percent of those affected are women. It has been estimated that autoimmune diseases are among the ten leading causes of death among women in all age groups up to 65 years. The article and video posted on Detoxdieter.org details what causes leaky gut syndrome, why it is dangerous, and how to treat it using vitamin C, essential fatty acids, and other nutrients found in natural foods. According to Michael Healey of DetoxDieter.org, “Leaky Gut Syndrome is a debilitating and dangerous condition. 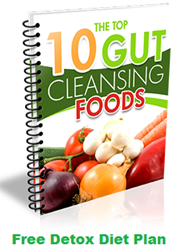 This report provides you with the information to address the health conditions associated with Leaky Gut Syndrome." The Leaky Gut Syndrome Explained article and video from Detox Dieter is available at: http://detoxdieter.org/leaky-gut-syndrome-explained/.